Nails and screws are among the popular types of fasteners which are most commonly used by carpenters in their daily activities. Most of the time, carpenters use these tools in many applications like doors, chairs, windows, furniture, etc. But, people are confused, which is better for joining materials together, nails or screws? When selecting fasteners, you need to consider the nature of the job and the materials that are involved. Generally, nails are more popular among st the carpenters as they are easy to work with it and save the time. However, when strength is more concern, you need to use screws. When comparing nails vs screws, we need to consider few factors, i.e. strength, material, size, cost, etc. Nails are consist of 3 parts; head, shank and point. The head of the nail is enlarged and flattened to allow easy hammering. The shank is the long thin portion of the nail. Nails hold materials together through the friction created between the shank and the material. The nail point is the tapered portion at the end of the shank. The head of the screw has a recessed area that accepts a tool, such as a drill or a screwdriver, which turns the screw into place. The threads are the helical ridges along the screw, which provide the friction that keeps the two materials together. The pitch is the distance between threads. Furniture that generates sideways pressure, i.e. lateral forces where material would have the tendency to move left or right (sideways movement) this is when you would use a nail. If you are making lightweight furniture where almost no load is coming and nails are acting as only glue, then you can use nails. For example, if you are making drawer bottom, cabinet framing, etc. then you can use nails. Furniture that will try and separate from the top or bottom, then you can use a screw. Screw is recommended for making furniture of plywood, blockboard, MDF, etc. as it has a good holding strength. When strength is a larger concern, i.e. at all joints, then you can use screws. For example, If you are making a wardrobe, modular kitchen, chair, etc. then you can use screw as it has good holding strength. If you are making long shelves, benches, tables, etc. where length of the furniture is more than 6-7 ft. then you can use screw. Nails are generally made up of mild steel, although it can be made of aluminium, brass, or many other metals. Screws are made up of brass, stainless steel, M.S. coated with chrome, etc. Round Wire Nail, Oval Wire Nail, Finishing Nails, etc. are types of nails commonly used in making furniture. There are various types of screw like, Countersunk Screw, Raised Screw, Round Screw, etc. Nails have higher shear strength compared to screws. Screws have a much higher tensile strength compared to nails. Nails are more flexible. If you hit with a hammer at a bad angle it will bend. Screws don’t have that flexibility in comparison of nails. Nails are less resistant to rust. They are highly resistant to rust and prevent moisture to come in contact with its metal. Also Read: What are the Properties of Brass? Nails are cheaper than the screw. They can be installed faster. Two or four blows from a good hammer and you can drive a nail all the way into the wood. Finishing nails can be easily hidden on furniture surface as it has a small head. In lightweight furniture, where almost no load is coming, then you can use nails. If you accidentally bend a nail by hitting it at the wrong angle, you may be able to hammer it straight again and reuse it. 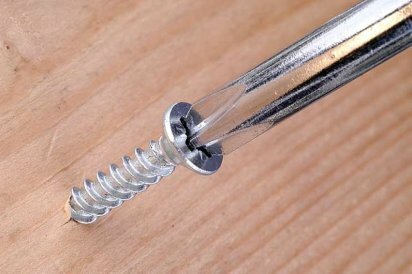 The screw is recommended for making furniture of plywood, MDF, etc. as it has a good holding strength. They are highly resistant to rust and prevent moisture to come in contact with its metal. This makes it more preferable for a long-term solution than nails. With the availability of screws in different sizes with varying thread, patterns offer great chance to choose as per requirement for long term strength. They are easier to remove than nails. With screws, you can decide where exactly to put them in and install them slowly and methodically with the use of drill or screwdriver. Nails are not recommended for plywood, blockboard, etc. as when nails are hammered; nails get bent or even split the wood. Nails do not have good holding capacity as compared to screw. Nails are installed with the use of hammer which requires more force to install. The head of the screws are usually larger than its body, therefore it becomes difficult to hide it discretely. It requires skilled labour for installation. It is not flexible as compared to nails. Also Read: Do’s & Don’ts to for Your Wooden Furniture Care! The size of the nails depends on where you want to use the nails. Generally, the size of the nails is 1/2 inch to 5 inch. The most common gauges (screw’s diameter) are between 2mm and 16 mm diameter and 0.25 to 3.5 inch length. They are less expensive than screw. The cost of the nails depends upon the size of nails and materials. Screws are more expensive than nails. The cost of the screws depends upon the size and material. From the above comparison on nails vs screws, we can conclude that though nails and screws, both are used for same purpose, screws have more holding strength than nails and hence are always better option. Therefore you need to make rational and judicial choice as per your specific needs. 6 Must-Know Tips To Buy Furniture Online! Previous PostPrevious How to Make Your Own Terrace Garden – Step-By-Step Guide!